Recently, I took possession of two children’s chairs from Aaron Sterritt destined for our new-ish nephews. 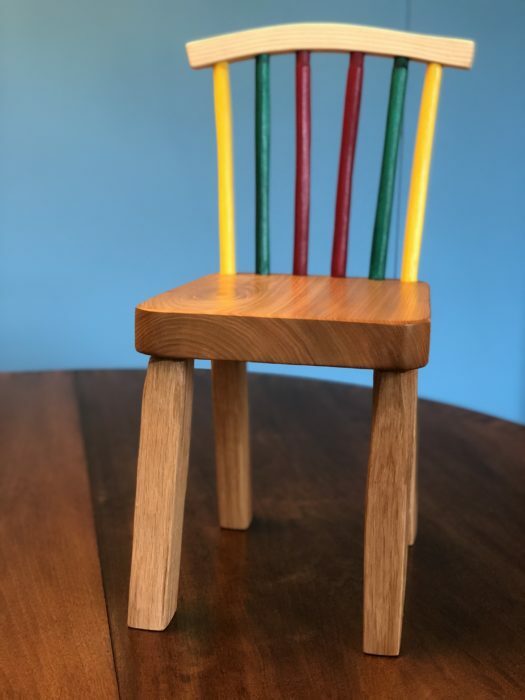 These delightful, colourful pieces are sturdy and functional and I can’t wait to see the nephews using them in a few months time along side the chairs already given to their older brother and sister at their Christenings. I love the idea of these handmade children’s chairs grown, felled, milled/cleft and made right here at Logie. To me this is modern vernacular furniture at its best; practical and functional, made by a craftsman from local, natural materials. I took the chance to ask Aaron about the chairs and his knowledge and enthusiasm made me want to share their creation story with you. Aaron says he’s learnt making children’s chairs as he’s gone along, using his own daughter to test them out. He’s discovered that it’s more-or-less exactly the same as making an adult chair. The only difference is that you don’t need stretchers across the legs because they’re low enough not to need the extra support. 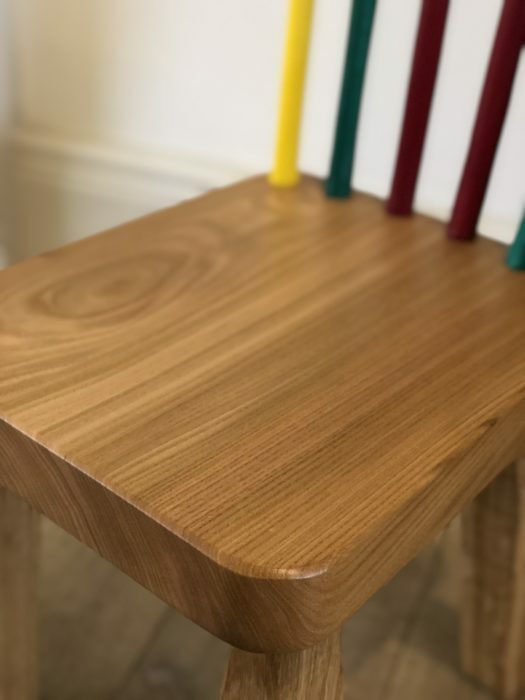 Aaron tells me that elm is traditionally used for seats because it’s very strong and when you hammer in the other components of the chair it doesn’t split – due to its swirly grain (which doubles up to look really good on the largest surface of the chair too). 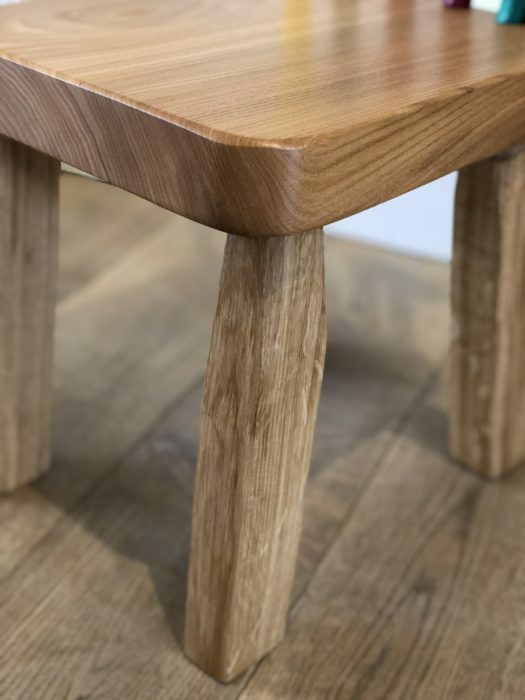 Because of its strength you can use Elm only an inch thick as seat material but with most other woods it would have to be at least two inches thick in order to be strong enough for the job. Traditionally, ash was used more for chair legs but Aaron likes to use oak.  The legs are all hand split (cleft) rather than sawn and oak splits at right angles very easily (tangentially to the grain – it splits both along and across the grain at right angles). This is why you get the nice squareness to the legs, which is the natural shape and hasn’t been sawn or sanded. In stead it is finished just using a draw knife and a spoke shave. Ash is the traditional material for spindles because it’s very strong along the length of the grain (hence it’s used for things like sports bats). The top is also Ash that’s been steam bent. Ash is happy to be bent this way because it has a long straight grain. Again, these are hand-shaped with a drawknife rather than using a saw or sander. 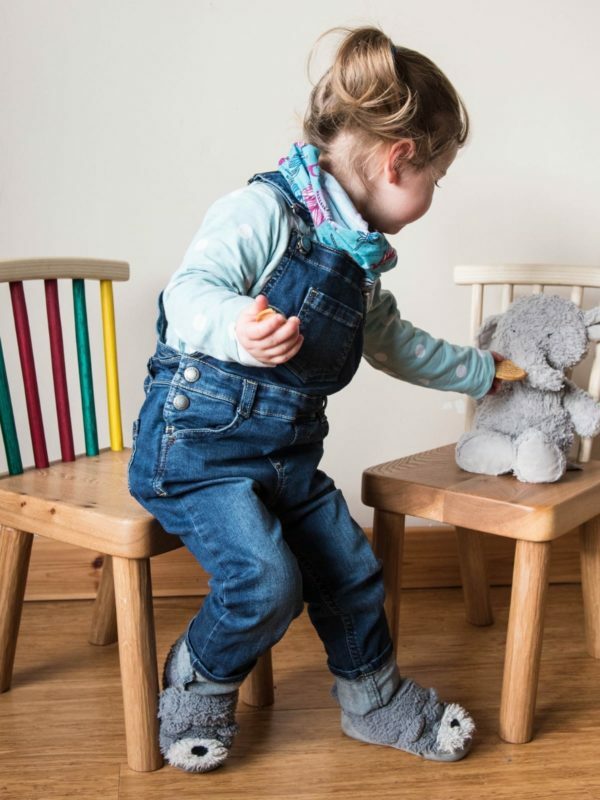 Why commission a child’s chair? Aaron pointed out that children’s chairs need to be versatile because children grow and change all the time, so while it might be used to sit on at a desk at one point, at another it might be used as a stool to stand on and at another as a useful ornament. My siblings and I were each given a child’s chair when we were small and mine now sits in my daughter’s room. In fact it came to me from an older cousin. It’s lovely to see it back in daily use by a child after years as a step to reach the high shelves in my mum’s larder. Juno sits on it to read, and I lay out her school clothes on it at night for the morning. In my view, a well-made child’s chair is an heirloom to hand down, along with its story, to the next generation. Aaron is a different kind of woodworker. He creates contemporary pieces of furniture and sculpture in wood that are inspiried by the natural characteristics of the material itself. He has an innate understanding of wood and is completely focused on shaping the wood in a natural way: splitting along the cells of the grain, keeping the timber intact and creating natural shapes. His furniture and sculpture are a testament to his principles. Aaron has a workshop at the end of the Logie Steading drive. 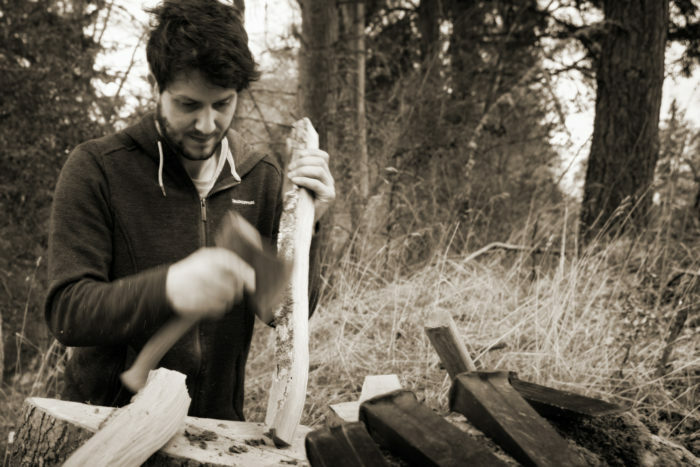 He runs his green woodworking courses from here, so you can have a try at making your own unique piece of furniture for yourself. He has a selection of furniture on display in Logie Steading Art Gallery. 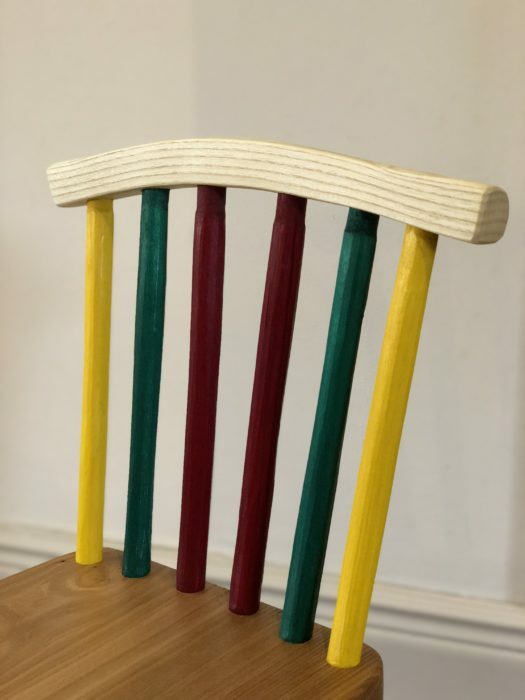 He will also be exhibiting one of these chairs amongst his pieces at Logie Steading Christmas Market on 8th & 9th December 2018. Come along and see for yourself!